Today a friend is visiting Whidbey Island, and hearing her talk about her planned visit reminded me of my dad, as he lives nearby. You might recall that last summer I went 'to tea' with Dad and he enjoyed asking the tea hostess so many questions about the food and tea service. I simply think he enjoyed the attention! Afterwards we visited the Lavender Wind Farm and enjoyed the abundance of lavender in late bloom. Alma is shown in the picture as she walks amongst rows of lavender and orange poppies. In another field, huge yellow sunflowers complimented the lavender in bloom. Fog from the sea was wafting through the fields as we were there, creating a surreal appearance that added to the tranquility of it all. Lavender has many uses. In the late summer, mix lavender flowers with drinks like iced tea or lemonade for a refreshing beverage. Or sprinkle it's blossoms onto favorite desserts like peach shortcake or chocolate mousse. Bunches of late summer lavender can be gathered and dried, then placed in a mesh bag that can be tucked into a lingerie drawer where it's fragrance can be enjoyed each time you open the drawer. It doesn't matter if the flowers are past their prime if you are using lavender in this way; the fragrance is just as nice. Bunches of lavender can be gathered fresh and placed in copper pots or ceramic vases. Don't worry about adding water; instead allow them to droop a bit (it adds character) and let them dry. You'll have a pretty arrangement that lasts all year long. Sometimes people aren't sure when the best time is to harvest lavender. I think that ANY time is the best time, but I admit to being crazy about lavender! Most people would say that lavender is best harvested when one-third to one-half of the spike is in bloom. So, happy travels on the island, friend who's so fortunate to be there today! I hope you enjoy your visit and create many memories of sunshine and flowers --- times that will cheer you in the rainy days of winter to come. And to Dad: I look forward to tea with you again soon! This is the exact picture we saw yesterday. We enjoyed ice tea and refreshment at Anna's Tea Room and then walked through the lavender farm. I loved the poppies and sunflowers among the lavender. They had also displayed the word JOY from pieces of drift wood, very clever. Thanks for posting the adventure. Now today we are off to Sequim for more lavender. You are single-handedly responsible for my selection of a lavender talc while shopping yesterday! It's the closest that I can come to this wonderfulness. Lovely picture of your friend walking through the lavender. Hope that you get to have tea with your dad again very soon! Everyone needs attention now and then. Lavender is perfect all the time! I have been harvesting lavender most of the summer now. I keep the flowers in a jar with a lid so that when it is full, I can make sachets for winter clothing storage. I adore this picture! I am going to have to go someday and visit. I didn't know there was a lavender farm on the island. 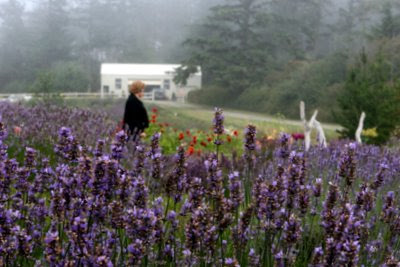 Hello there, I visited Whidbey Island several years ago but had no idea it had a lavender farm there. We have always said how much we would like to go back and this time I have added this farm on my list of places to go. Lovely post, lovely blog. Lavender is wonderful. I also enjoy them drooping in a vase.